Lead Acid, Li-ion, and Nickel-based Batteries: Another 101 Primer on ‘The Best Battery for Your Build’ by @ArrowGlobal « Adafruit Industries – Makers, hackers, artists, designers and engineers! We love batteries here at Adafruit! And we like to blog useful articles about batteries as often as we can – from An Average Introduction to LiPo Batteries to useful guides on batteries for wearables and other consumer devices. 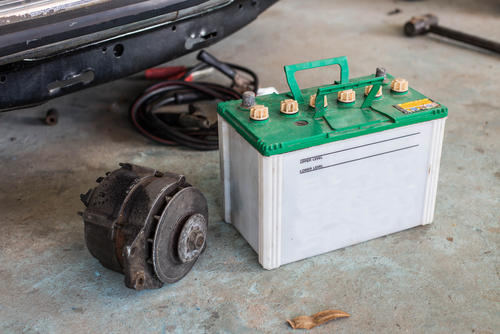 Here’s another one for the archives, a simple primer on the differences between Lead Acid, Nickel-based batteries like NiMH and NiCD, and Li-ion options – as written by Nick Powers from Arrow Electronics. As more systems go mobile, batteries are becoming increasingly integral to design. They come in all shapes, sizes, and capabilities but no single one is perfect for all challenges. There are huge differences between chemistries, and a lithium-ion may not always be the right solution. In this article we will walk through a comparison of nickel metal hydride, lead-acid, and lithium-ion batteries looking at the benefits of each and the unique areas in which they excel. I am going to work backwards through the chemistries going from least energy dense to most dense by weight. Energy density is usually measured in Wh/Kg or Wh/L giving us the amount of stored energy by weight or volume.